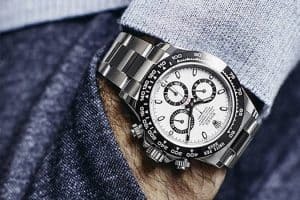 Lasting style in a ...can? Hairspray, naysayers claim, decimates the ozone layer (no longer true …mostly) and is the preferred mop-freezer of a certain perma-tanned POTUS (completely true). But, thanks to the wonders of modern hair products, a crusty quiff and an irrevocably damaged atmosphere are no longer givens when wielding a can. It’s not only problem hair types which can benefit from a spritz of vapour. For perennially trending hairstyles such as the pompadour or the classic quiff, a hairspray will help keep your hairstyle on its best behaviour, without leaving any obvious signs of grooming wizardry. Once you’re out of the barber’s chair, you have to learn to apply the strong stuff yourself. Fortunately, it’s not difficult. First, make sure that the hairspray you’re using is tailored to the finish that you are trying to achieve. Different formulations offer various finish properties such as volume, shine, a reworkable hold, an extra strong hold or a natural matte finish. Check that the nozzle is clear of obstruction to ensure that the spray leaves the can as an even mist. To ensure an even, light layer of hairspray, always apply from around 8-12cm from your head, moving the nozzle around until a light mist has covered all of your hair. Prevent it from getting into your eyes by holding one hand across your brows and using your free to hand to apply the spray. For specific areas of your hair which require extra volume (such as a quiff) try holding this hair in place after you have applied hairspray until the application has dried. Or if all-over volume is the hair trend you’re looking for, keep your head is upside down and spray the underside of your hair towards your roots to create extra lift before you fix your final style into place. To ensure coverage of stray hairs around your hairline, apply hairspray directly to your fingertips then use them to coat and smooth these hairs into place. And if you need extra hold or shine, layer your hairspray. Apply lightly and evenly then let each application set, repeat until you’ve achieved your desired finish. The Aveda brand party line is eco-friendly and planet preserving, so unsurprisingly you’ll find no nasties in this hair-taming spray. The formulation offers a firm hold and frizz-banishing humidity defence, then there’s the added bonus of its claimed net-zero climate impact. Going green never looked so good. 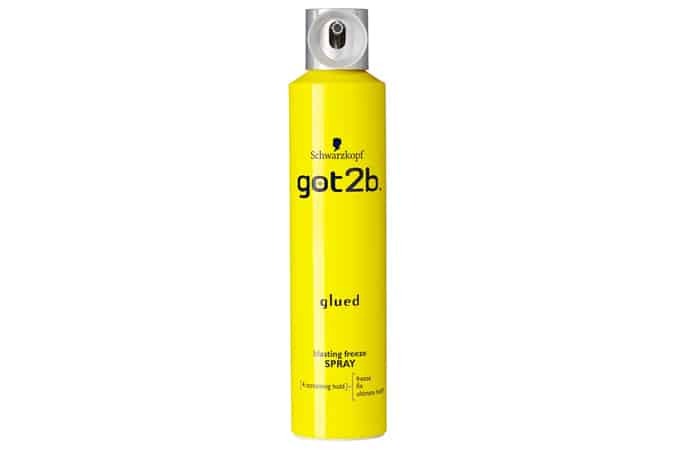 If you’ve been saddled with flyaway hair, only the toughest stuff will keep your locks in check, which is where Schwarzkopf’s got2b Glued Blasting Freeze Spray comes in. Like its name suggests, it offers a vice-like hold that will stop your hair in its tracks, even on the windiest days. Debunking the myth that hairspray is all industrial-strength chemically-powered pollutant, Kevin Murphy’s Anti Gravity spray brings together Manuka honey, lavender oil and grapefruit extract to promote hair growth, so you’ll get loads more than just weightless volume and shine here. Demonstrating that holding hairs steady isn’t the only trick that hairspray can pull off, KeratinMD’s hair building spray is packed full of organic keratin fibers to give your barnet more body while holding it in its place. Donald Trump, take note. Super by name, super by nature. Paul Mitchell’s 2-in-1 hair spray will allow you to cut corners in your quest to achieve your very best hair day, thanks to a double whammy of a super strong hold and mirror-like shine. We love a good multi-tasker. American Crew has built up a reputation as the thinking man’s grooming brand of choice thanks to fuss-free formulations that work. True to form, the brand’s Classic Grooming Spray offers a medium, flexible hold and comes packed with added bonuses such as UV protection and conditioning aloe vera. Premium Scandinavian brand Sachajuan nails that whole tasteful minimal thing from the get-go with its hairspray’s packaging, but underneath that achingly cool exterior you’ll find a powerful protein-enriched formulation. The barbershop favourite sets almost instantly for a strong hold without the crunch factor. If you’re the indecisive sort who lives with his hands in his hair, meet Living Proof’s flex hairspray which will have your hair’s back when it’s windy, but can be moulded to your every whim after application – it’s designed for a looser hold that can be restyled throughout the day.